SIMPLY PUT...ONE OF THE PRETTIEST INTERIORS OF ALL TIME. SO WHY STAY WITH A STOCK CADILLAC 390.... WELL....IT'S A CADILLAC 390 ! ....WITH 325 STOCK HP! IT'S WASN'T A RACE CAR....BUT IT WAS QUICK! IT HAD DUAL FLAME THROWERS AND WON FLAME THROWER EVENTS! 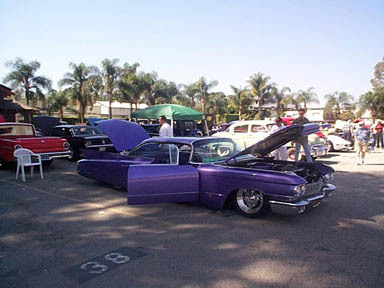 "DIABOLICAL PURPLE" HAD WON NUMEROUS CAR SHOW EVENTS! 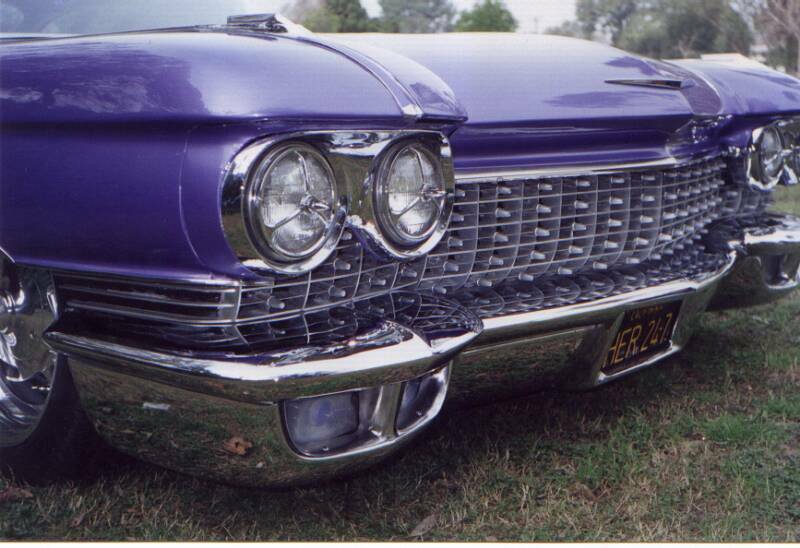 I LOOKED ALL OVER THE COUNTRY FOR A 1960 CADILLAC...BUT FOUND ONE IN VAN NUYS CA. IT WAS A GOOD SOLID CAR...I DIDN'T CARE WHAT COLOR IT WAS...JUST THAT IT HAD ALL OPTIONS...AND WAS RUST FREE. I KNEW WHAT I WANTED TO DO...AND HAD RESEARCHED COLORS AND MATERIALS FOR OVER A YEAR. LOCATING THE CAR AND MATERIALS WAS THE HARDEST PART. 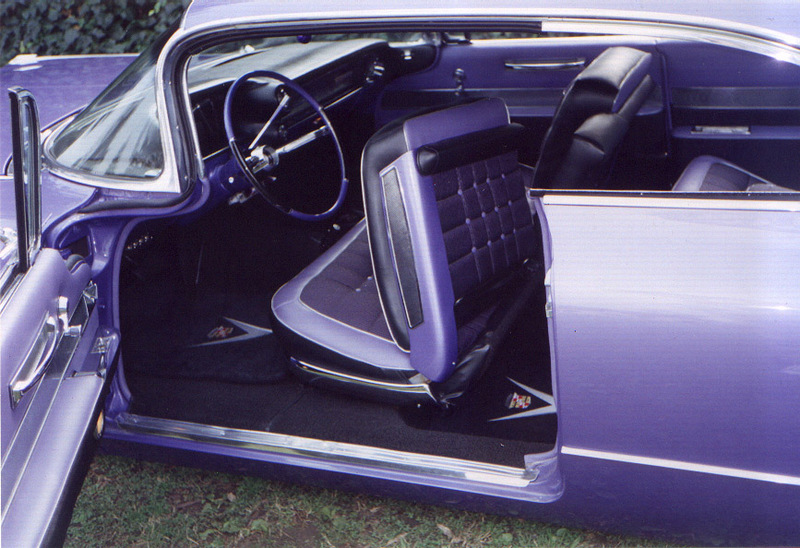 WHEN "DIABOLICAL PURPLE" WAS FINISHED IT HAD REMOTE CONTROL DOORS, WINDOWS AND STEREO. IT HAD DUAL FLAME THROWERS. A REAR TV TO BE WATCHED THROUGH THE REAR VIEW MIRROR. IT HAD AIR SUSPENSION, A 12 DISC CD SOUND SYSTEM AND POWER EVERYTHING......IT SAT SO LOW WHEN IT LANDED THAT IT WAS ALWAYS THE LOWEST CAR AT ANY CAR SHOW EVENT THAT IT ENTERED. THE AUTO WAS FRENCHED,SHAVED, DECKED AND NOSED....I DECIDED THAT THE 1960 HARD TOP WAS TO TO PRETTY TO CHOP....IT ALREADY APPEARS CHOPPED. 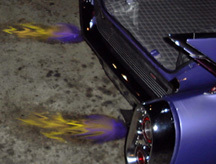 I WANTED THE BODY WORK TO BE DONE AT A FAMOUS PLACE...IN ORDER FOR IT TO BE A COLLECTABLE PIECE..I CHOSE GEORGE BARRIS/STUDIO CUSTOMS TO DO THE PAINT AND BODY...AS A MATTER OF FACT...IT'S THE LAST CUSTOM CAR TO COME OUT OF THE BARRIS SHOP OF THE 20TH CENTURY. GEORGE BARRIS PERSONALLY GAVE ME THE BADGES THAT GRACE THE AUTO AND SHARES THE COMMON THREAD THAT LINKS THIS BAD BOY WITH OTHER NOTABLE CARS THAT WERE PRODUCED IN EXACTLY THE SAME LOCATION....SUCH AS THE FAMOUS "BATMOBILE" OF THE 1960'S TV SHOW "BATMAN"..... AND "THE MUNSTER COACH" ALSO FROM THE TV SHOW CALLED "THE MUNSTERS".... ALSO ON IN THE 1960'S. THIS FINE AUTO HAS BEEN DESCRIBED BY MANY..AS THE SEXIEST THING TO EVER COME OUT OF THAT SHOP! IT WON MANY PRESTIGIOUS SHOWS INCLUDING THE CUSTOM DIVISION AT THE BEVERLY HILLS ANNUAL CHARITY EVENT....CONSIDERED TO BE NO.1 OR NO.2 IN CALIFORNIA CAR EVENTS. AFTER WINNING THAT EVENT, IT WAS ASKED TO BE SHOWN AT THE PETERSEN MUSEUM FOR 2 MONTHS. LATER...IT WAS SOLD TO A FAMOUS ATHLETE.... WHO HAS BEEN RUMORED TO HAVE RUINED THE CAR.